Every passing year IT equipment and network requirements dig deeper and deeper into the educational institutions, so much so that the classrooms of today are so dissimilar to the classrooms of 2 decades ago, that most older than 30 may not recognize them. This advancement and reliance on technology is empowering our educators and students to push the boundaries well beyond what was every though possible, but in order for the learning to continue, the systems and networks that these advances rely on must be monitored and maintained effectively or we will be back to basics. By deploying a Nagios solution, learning institutions can benefit from Nagios’ comprehensive monitoring and alerting capabilities. By providing pro-active alerts downtime can be drastically reduced, keeping systems online and the classrooms functioning. Monitoring of key performance metrics provides invaluable information necessary to plan and budget for future system upgrades, or prepare for required maintenance. By implementing Nagios, top schools and universities IT staff can receive instant notifications of website and system outages. Without fast resolution these can affect their public image and even slow the learning process. Once alerted, IT staff can resolve problems more quickly, thus lessening the impact of outages, reducing or eliminating downtime. 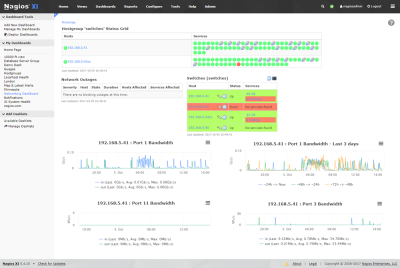 Nagios XI is the most powerful and trusted infrastructure monitoring tool on the market. Millions of users and thousands of companies - ranging from Fortune 500s to small business owners - trust Nagios XI to get the job done.